While we may not yet have a clear answer to what came first, the egg or the chicken, when it comes to the first meal of the day…the egg wins hands down. The high nutrient value of eggs make them an excellent way to start the day or for that matter a healthy snack at any time of the day. Eggs are a rich source of protein and also contribute to increase the HDL (good cholestrol) in the blood stream. Eggs are also high on the satiety index, which means that they keep you feeling full for longer. This means that you are less likely to reach for an unhealthy snack, this reducing the total number of calories consumed. 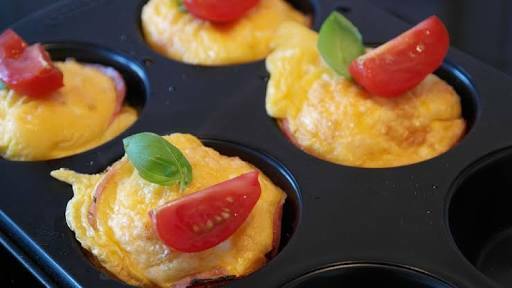 Egg muffins are perfect for those busy mornings when you don’t have the time to flip omelettes. Just a few minutes in the oven is all it takes to get this wholesome breakfast on the table. Grease a six-slot muffin pan with oil. Or, line the muffin pan with paper cups and avoid the oil. In a nonstick pan, heat the oil. Sauté the onions and peppers. After they soften, add the spinach and mushrooms and sauté till the veggies are cooked and mist of the water has evaporated. In a bowl break the eggs and whisk together. Add the sautéed veggies, basil, salt and pepper and mix well together. Add the cheese, if using. Pour the egg and veggie mixture into the greased muffin mould and pop into the oven. Bake for 15-20 minutes. The top should brown slightly and the eggs should be cooked through. Remove from the oven, cool slightly and unmould. Serve hot with a chilli sauce. Add a dollop of pesto sauce or chilli sauce to the egg mixture to infuse the egg-muffin with more flavour. Obesity and Cancer Magic Potion for Weight Loss!